Healthy Hair Diary: Unhealthy Hair Habits! We have all at some point or the other done our hair a disservice. Bad hair habits are hard to break but if your aim is to have healthy hair there are some unhealthy hair habits that you need to kick. These are some unhealthy hair habits that are preventing you from achieving the health and length that you desire. Unless you have a medical condition that is preventing hair growth, your hair grows. The reason why you are stuck at one length is because you are not retaining length, change your mind-set towards your hair and you will reap the benefits. When you do things like tease your hair, comb or detangle from root to tip and rub your hair with a towel, you are begging for breakage. Be gentle whenever you are manipulating your hair, black hair is more susceptible to brakeage than any other hair type because of our unique kinks and curls. Cleanse your hair to remove things like product buildup and dead cells that can clog hair follicles and stunt your hair growth. You can cleanse your hair using a sulphate free shampoo followed by a deep conditioning treatment at least once a week. Using heat tools frequently will cause hair damage. Limit the use of heat as much as possible or cut it out completely. 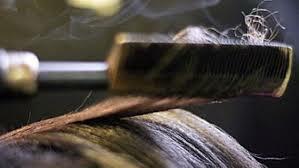 Excessive use of heat causes thinning, breakage and split ends. Black hair is the driest of all hair types; it is the reason why our hair craves moisture. Dry hair breaks easily, moisturise and seal your hair regularly to help prevent breakage. Hairstyles like wigs, weave, braids, twists and buns make great protective hairstyles but if done tightly they do more harm than good. Gradual hair loss, especially around the hairline, is caused by frequently wearing tight hairstyles. This is a condition known as traction alopecia. If you don’t get rid of split or damaged ends they would only get worse. There is no product that can “fix” or “repair” split or damaged ends despite what companies claim. The only way to get rid of it is by trimming your ends. Hair grows an average of ½ inch per month, when you relax too often you run the risk of overlapping your relaxer. Stretch your relaxers, this simply means to extend the time frame between touch-ups. This can be done gradually if you are new to relaxer stretching. Any of these habits you plan to kick? Leave us a comment and let us know. ......read more over at The COCO Magazine!